ROMAN EMPIRE. Augustus. Circa 25-22 BC. AR Denarius. Colonia Patricia mint. PCW-R4663-ROMAN EMPIRE. Augustus. Circa 25-22 BC. AR Denarius (3.60 gm; 17 mm). Colonia Patricia mint, struck 19 BC. CAESAR AVGVSTVS Head right / OB CIVIS SERVATOS Oak-wreath wreath with jewel at the top and with the ties extending upwards. RIC I 77a; RSC 208; BMC 378. 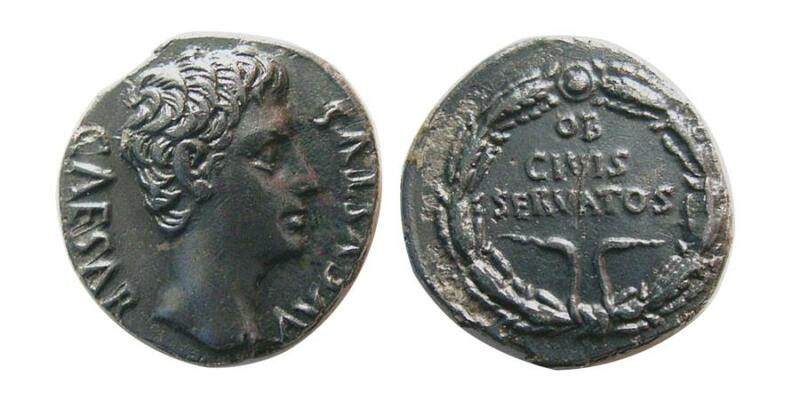 The reverse depicts the oak wreath, the Corona Civica, awarded to Augustus by the Senate for having saved the Republic. Well struck on a nice compact flan. Nice original find patina. Choice EF. ROMAN EMPIRE. Augustus. 27 BC-AD 14. Silver Denarius. ROMAN EMPIRE. Vitellius. AD. 69. Silver Denarius. Rare.